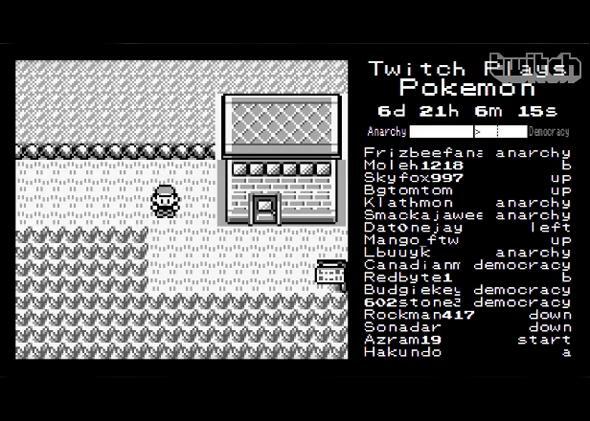 Twitch Plays Pokemon allows 80,000 people to all control one Red Version game at once. Watching Twitch Plays Pokemon is frustrating because it takes forever for anything to happen or get done, but it’s also strangely compelling. Photo of Twitch Plays Pokemon. Pokemon may not factor heavily into your daily life, but you kind of know it’s there. Like Britney Spears or the McRib, it’s something that percolates in the back of mainstream pop culture’s hivemind and occasionally comes to the fore. And that’s why Twitch Plays Pokemon is such an amazing phenomenon. It’s thousands of people all simultaneously giving inputs to an emulator of the classic Pokemon Red Version game, or just watching the frustrating madness unfold. Here’s how they’ve responded. There’s a delay and, you know, thousands of other people also entering commands at any given time, so what results is a crazy explosion. Basically Red* (the character you control in Pokemon) just turns around a lot and looks through his items. There’s been some drama with people trolling by intentionally making Red jump off ledges he’s supposed to avoid, and there have been problems with the character getting stuck behind objects like trees, but for the most part, things are actually happening. The creator even implemented a two-mode system where players can either vote to be in total “anarchy,” where the trolls can rule, or move into “democracy” mode where the bot collects commands for a short interval and then uses the most popular one to move Red. As time wasted on the Internet goes, this exercise in teamwork is actually kind of valuable. *Correction, Feb. 20, 2014: This post originally stated that the main character in Pokemon Red Version is named Ash. He is actually named Red.